The Calydonian Hunt is a story of Greek mythology. To sum up the events, an angry goddess (Artemis) sends a beast (wild boar, to my understanding) to decimate the city of Calydon. An alliance of Greek heros join forces to destroy Artemis' beast. Now, let's all put ourselves in the shoes, well sandals in ancient Greece, of the heros. What do you want to hear? What will prepare your mind to battle a monster boar? I think we have found just the tunes for such an occasion. 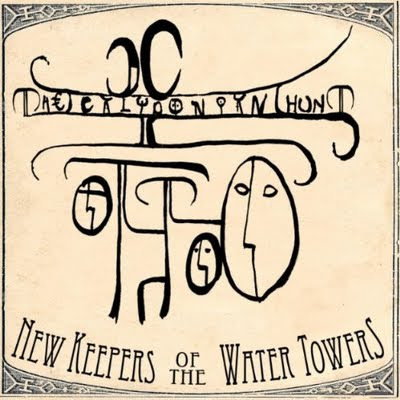 New Keepers of the Water Towers are a Swedish quartet (Rasmus - riffage & vox-supreme, Thor - skin violation & vital shouts, Victor - brutal bender & guttural luring, and Robin - quad string doom bringer) with massive aspirations. One only has to experience a taste of The Calydonian Hunt to see this. Meshing heavy metal, hard rock, and dueling guitars NKotWT bring a sound familiar to Mastodon, Baroness, and Bison. If you are a serious fan of the above bands, read no further... simply go buy this, you will be satisfied. The Calydonian Hunt bring me back to the first time I listened to Mastodon's "Leviathan". There are similarities in the music, but its the foreboding sensation these two particular records bring. The sheer horror of an authentic monster seeking your blood. Heavy stuff. Abyssal Lord launches the hunt. The drums and guitars battle for your attention at first. The song turns to a fast repetitive strumming while Rasmus begins belting the war cry. The vocals complement the instrumentals extremely well. One listen to Abyssal Lord and the fluent transition into track two, the title track, we know what is in store for the rest of the album. The title track, The Calydonian Hunt, flows exceptionally well off of Abyssal Lord. Combining a balanced share of harmony, cleanly sung vocals, and blasts of menacing force, The Calydonian Hunt [song] will certainly be a favorite amongst the fans here at Heavy Planet as well as myself. I hope NKotWT will release the lyrics to these songs, I have a good feeling this will go along with the Greek story. My personal favorite track of this album is "Crystal Lake". It simply feels like so much bigger of a song than the four minute run time displays, very melodic, very epic. Beginning with a heavy rolling intro, blasts of dual guitars, smash of snares and cymbals then transitioning into a melancholy verse, the song really pulls us listeners into the story. The last minute returns to an upbeat pursuit of the beast. As quickly as we arrived, we depart. At first, I under-estimated NKotWT. I thought to myself, just an attempt to sound like our Southern progressive favorites... I couldn't be more wrong. Rasmus, Thor, Victor, and Robin have a lot more to offer. The Calydonian Hunt is a solid album and I believe we will only hear better and better from The Keepers. The album does go quickly, around a thirty minute run time. This certainly does not take away from the high quality of song writing, melody, and riffage! My only true gripe is the artwork, I personally do not feel it fits the music. I would like to see an epic battle between our hero's (The Keepers) and the beast (kind of like a Amon Amarth cover). I was happy, however, to discover that the band produced the artwork. Though I may not be wild about it, I do applaud. It keeps my faith that there are true artists out there. Rasmus and company are. The Calydonian Hunt, an unshakable 8 out of 10.